This set of predictions rounds up the lower tier categories and begins the accent to the major ones. These predictions will focus on the seven categories that make up the atmosphere of a film: Original Song, Original Score, Costume Design, Production Design, Makeup, Visual Effects, and Film Editing. This is an interesting category in that its number of nominees varies from year to year. Current prerequisites for a nomination require that the song is originally written for a film and that the song is completely original and not partially sampled from another source (as was the case with 1995’s “Gangsta’s Paradise” from Dangerous Minds). They also require that if the composer was a former governor of the Academy music branch, he can’t contact 1/3 of the voters asking them to “consider” his song. This year, the latter occurred resulting in a revocation of the nomination for “Alone Yet Not Alone.” So now it comes down to a catchy tune versus a song with momentum. Frozen’s “Let It Go” has captivated the minds of children like the best of Disney’s songs, but U2’s “Ordinary Love” is riding high after a Golden Globe win. Flip a coin on this one. John Williams (The Book Thief) may have five Oscars, but he has been nominated 49 times (including a loss last year for Lincoln), suggesting that he is not an Academy favorite. Additionally, the five Oscars he has are for scores much more memorable and powerful than The Book Thief. The film with the most substantial use of music is Her, but the momentum is with Gravity. The key to this category is not to get too caught up in the film itself but rather focus on the creativity, authenticity, and accuracy of the costuming. Period pieces are favorites in this category and we have five of them, even the martial arts film! 12 Years a Slave and American Hustle have the most nominations overall and are potential threats here. The interesting factor here is that Catherine Martin is nominated for costuming her husband Baz Luhrmann’s film, The Great Gatsby. She won this award in 2001 for Moulin Rouge when she was in this exact same situation. That year Moulin Rouge was nominated for eight Oscars but only won two: Costume and Production Design. This year The Great Gatsby is only nominated for two Oscars, but they are for Costume and Production Design. The Oscar for Production Design goes to the art director who best accomplishes the appropriate mood for an audience’s experience through visuals, movement, and other varieties of art direction. This can be a complicated job, and an A.D.’s success relies on whether or not an audience is appropriately affected psychologically by a film. From a psychological standpoint, these films all offer wildly different ways of using style and motion to affect an audience. However, four of the five nominees here are also nominated for best picture, so it is likely that this award will be tied to that award. In a year of impressive films, it’s hard to believe that only three of them included Oscar-worthy makeup and hair. Last year, this went to the team behind the musical, Les Misérables ; but typically this award goes to wildly imaginative, over-the-top makeups and hair. Could it possibly go to…a Jackass movie?!? Damn straight it will! No other nominated film relies on this art form more, and no other film does it to such an intricate degree. Ok, now we get down to films that the average filmgoer can evaluate. The Visual Effects Oscar goes to a film that demonstrates greatness in the world of special effects. If one were to see all of these films, there is certainly something to admire in four of them. However, only two of these films made The People’s Critic’s top 10 films of 2013, and a large part for why one of these films ended up just edging out the other was its visual effects. This is an impressive award to win and the Academy does not treat that lightly. 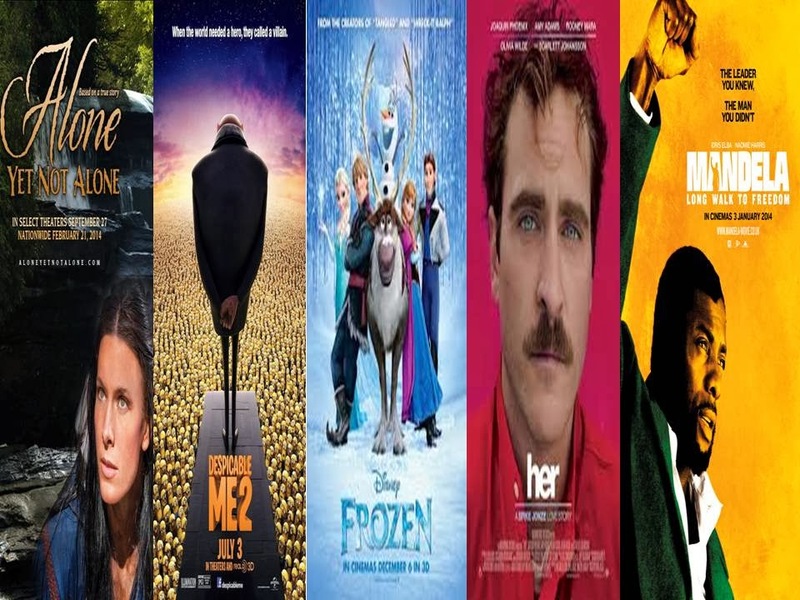 The winner for Best Film Editing has often been the film that wins Best Picture, and it is no surprise that all five films nominated here are also nominated for Best Picture. The editing of a film is nearly as important as the direction since it affects the story, the pace, and the tone. Often, great editing goes unnoticed by the viewer because of how seamless the story has been woven together. The major consideration here is that Jay Cassidy keeps knocking on the door first for Into the Wild in 2007 and then back to back in 2013 and 2014 as David O. Russell’s editor for Silver Linings Playbook and American Hustle. What is challenging to overcome is Cuaron’s masterful control over the intensity of his film, Gravity.